4 drawings on paper (1 sheet) : ink ; 9.5 x 6 in. Ink sketches of four men engaged in various activities in every day life, identified by inscriptions. 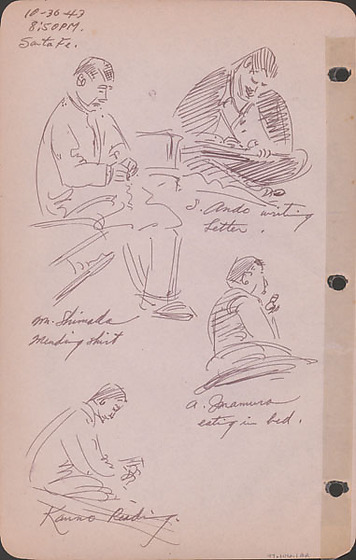 Top left image of a man, Mr. Shimada, seated on a bed mending a shirt ; dressed in long pants and long sleeved shirt, his head is inclined toward the sewing in his lap. Top right image of a man, S. Ando sitting crosslegged writing a letter on his lap ; he faces viewer as his head is bent toward his writing. Bottom left image of a man, Kanno, seated in profile facing right as he reads. Bottom right image of a man, A. Imamura, viewed from waist up as he holds food to his mouth while in bed. Drawing 97.106.1BQ on recto of same sheet. Written in black ink, top left: 10-30-43 / 8:30 PM / Santa Fe. Written in black ink, below drawings: Top left: Mr. Shimada / mending shirt Top right: S. Ando writing / letter Bottom left: Kanno reading Bottom right: A. Inamura / eating in bed.